The occurrence of post-exercise hypotension after resistance exercise is controversial, and its mechanisms are unknown. 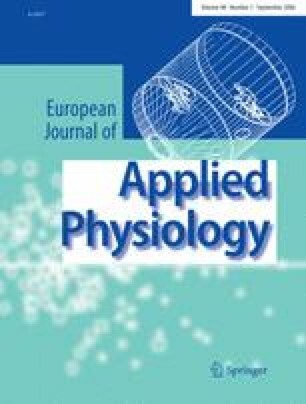 To evaluate the effect of different resistance exercise intensities on post-exercise blood pressure (BP), and hemodynamic and autonomic mechanisms, 17 normotensives underwent three experimental sessions: control (C—40 min of rest), low- (E40%—40% of 1 repetition maximum, RM), and high-intensity (E80%—80% of 1 RM) resistance exercises. Before and after interventions, BP, heart rate (HR), and cardiac output (CO) were measured. Autonomic regulation was evaluated by normalized low- (LFR–Rnu) and high-frequency (HFR–Rnu) components of the R–R variability. In comparison with pre-exercise, systolic BP decreased similarly in the E40% and E80% (−6 ± 1 and −8 ± 1 mmHg, P < 0.05). Diastolic BP decreased in the E40%, increased in the C, and did not change in the E80%. CO decreased similarly in all the sessions (−0.4 ± 0.2 l/min, P < 0.05), while systemic vascular resistance (SVR) increased in the C, did not change in the E40%, and increased in the E80%. Stroke volume decreased, while HR increased after both exercises, and these changes were greater in the E80% (−11 ± 2 vs. −17 ± 2 ml/beat, and +17 ± 2 vs. +21 ± 2 bpm, P < 0.05). LFR–Rnu increased, while ln HFR–Rnu decreased in both exercise sessions. In conclusion: Low- and high-intensity resistance exercises cause systolic post-exercise hypotension; however, only low-intensity exercise decreases diastolic BP. BP fall is due to CO decrease that is not compensated by SVR increase. BP fall is accompanied by HR increase due to an increase in sympathetic modulation to the heart. We gratefully acknowledge the volunteers involved in this study. We also thank Alberto Porta for providing the software for spectral analysis, and Mariana Curi for statistical support. Cláudio C. Rezk works at Centro Universitário FIEO and Universidade Santo Amaro. Regina C.B. Marrache works at Instituto de Cardiologia Dante Pazzanese. This study was supported by FAPESP (01/01952-8) and CAPES (Demanda Social).